Veneers are thin, customized porcelain or resin composite shells that are adhered to the front surface of your teeth to enhance their appearance. Once applied, veneers can alter your teeth’s color, shape, size, or length. Although porcelain is the most commonly used material, veneers can also be manufactured out of resin composite materials. Porcelain is one of the most stain resistant materials used for cosmetic dental treatments, especially veneers. Unlike other materials, porcelain does not stain when exposed to coffee, tea, wine, or soda. Veneers may be right for you if you are looking to alter the color, shape, or alignment of your teeth to improve your smile. It is also important to note that veneers are permanent and cannot be reversed once they are placed. To determine if veneers are the right cosmetic treatment for you, schedule a consultation with one of our dentists at Legacy Dental today! Will veneers match my other teeth? 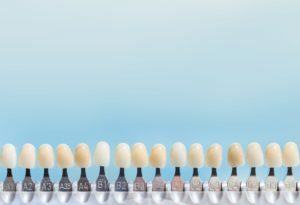 During your consultation, our dentists will determine the best color for your veneers using a special color chart. Most patients opt for a whiter shade than their natural tooth color and undergo a whitening procedure before the veneers are applied. If this is the case, then your color will be matched once the whitening procedure has been completed. This way, your veneers will match your existing teeth and have a natural appearance. Veneers work by sitting on the front surface of your teeth and replacing your tooth enamel. In order for veneers to work properly, about a millimeter of your tooth enamel must be removed so that the veneer shell can sit evenly on the tooth’s surface. Then, a light-sensitive resin is placed on the surface of your teeth and the veneer is adhered using a curing light. Veneers are usually placed within two dental visits spaced 1-2 weeks apart. During the first dental visit, the enamel is removed to make space for the veneers. Then a dental impression is taken and sent to a lab where the custom shells are made. Once the veneer shells are sent back to our office, they will be adhered during your second dental visit. Some veneers are “no-prep”, meaning that they do not require the tooth enamel to be removed before their application. Instead, they can be placed directly on your teeth, which saves time during the application process. Our dentists will help determine which option will work best for you during your consultation. Veneers are not bad for your teeth, but the enamel removed during their application will permanently change their shape. The amount of enamel removed is such a small amount that it should not cause any problems, however while your teeth adjust there may be a period of tooth sensitivity. This usually fades within a few days after your teeth have fully adjusted to the changes. Another common concern people have when getting veneers is whether they will increase the risk of cavities or tooth decay. Because veneers are essentially the same as natural teeth, the risk for cavities or tooth decay is the same as it would be in natural teeth without veneers. Just as with natural teeth, good oral hygiene will decrease the risk of developing cavities or tooth decay. How long your veneers last depend on the type of veneer and your dental habits. Porcelain veneers usually last about 10-15 years, with some lasting up to 20 years. Composite veneers tend to last about 5-7 years. 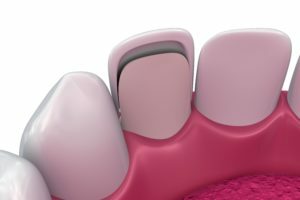 How can I take care of my veneers? Veneers are highly durable and can last for many years, however you will need to take care of them appropriately to avoid damage. 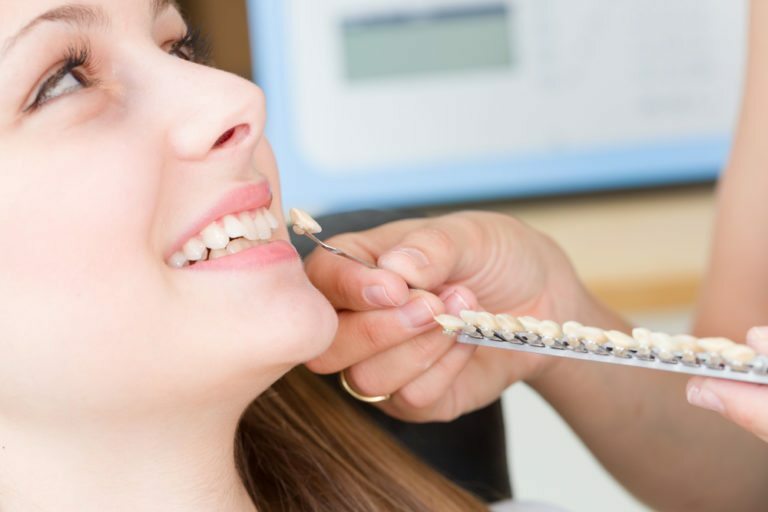 Caring for your veneers mainly consists of maintaining good oral habits such as brushing twice daily, flossing once daily, and visiting Legacy Dental at least once every six months for a dental checkup and cleaning. During your cleaning, a special paste will be applied to your veneers to keep their color. In addition, you will also want to avoid damaging your veneers. 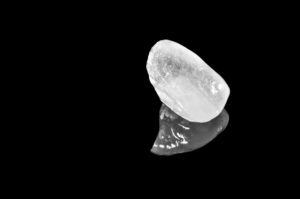 To prevent damage, avoid biting down or chewing on hard objects, using your teeth to open packages, or biting your nails. The cost of your veneers will depend on the number of teeth being treated and the type of material being used. Porcelain veneers are generally more expensive and can average approximately $925-$2,500 per tooth. Composite veneers, on the other hand, can average approximately $250-$1,500 per tooth. If you have dental insurance, some companies may offer partial coverage, however not all dental insurance companies provide coverage for cosmetic procedures. Our office may also be able to set you up with a custom payment plan to offset costs. Also, keep in mind that you may not need veneers on every tooth. Sometimes you can achieve amazing results by simply correcting a tooth or two, or maybe just a few. This may not work for everyone, so talk with our dentists to see if it’s an option for you.